Au cours des dernières années, la pression politique exercée pour détenir et expulser les migrants a été accompagnée d'un développement jurisprudentiel important portant sur la légalité des procédures de renvoi forcé et la détention. Le séminaire PICUM et EuropeanMigrationLaw.eu «Défendre les droits des migrants dans le contexte de la détention et de l'expulsion des étrangers », organisé à Bruxelles en 2017, a offert une opportunité unique de faciliter l'échange d'informations entre les praticiens du droit et les ONG européennes sur ces questions. Le rapport présenté ci-dessous est la synthèse des présentations et discussions du séminaire. Over the past years, political pressure to detain and deport more migrants has led to more case law that challenges the legality of various aspects in the forced removal procedure, including the legality of detention decisions. Civil society has a significant role in facilitating strategic litigation in this area. PICUM’s and the European Migration Law’s legal seminar “Defending migrants’ rights in the context of detention and deportation” in Brussels this year, offered a great opportunity in this direction by facilitating an exchange of information amongst law practitioners and NGOs from across Europe on the legal challenges in defending rights in the context of a strong political pressure to increase returns. For migrants’ rights advocates a reality check in terms of where we are with the case law was much needed. A report summarising the discussions of the event is available in English and French. Facing ongoing political pressure to lower the safeguards foreseen in EU and international law to the absolute bare minimum, it is crucial to be aware of the case law “red lines” that help counteract this trend. For example, there is evolving case law around the non-deportation of seriously ill persons (see for example ECtHR Paposhvili v Belgium, 41738/10) and on risk of absconding (CJEU Al-Chodor and ECtHR Del Rio Prada v Spain). The tireless work undertaken by legal practitioners to challenge deportation and detention orders seems never-ending and grossly undervalued. 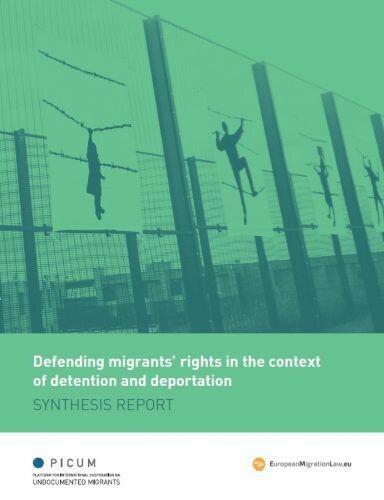 There was, however, broad consensus that more case law is needed to challenge in particular the legality of detention in order to get a better idea of where the boundaries lie in relation to justification of the grounds for detention. Participants of the seminar agreed that in most member states, detention is imposed far too quickly and without the necessary scrutiny of necessity and proportionality. The question around risk of absconding and its interpretations in different member states are central to this. How can we mitigate the risk of absconding without resorting to restrictions of freedom of movement? This is a point where civil society could have a role in offering solutions. Community placement and case management could represent a feasible alternative for migrants and the state. The existence of community based alternatives to detention would allow for the authorities and the judiciary to change its practice around issuance of detention orders and the “default” procedures that often couple return order with detention without much further thought. An interesting discussion around what do we understand to be “strategic case work” or “strategic litigation” unfolded at the meeting and is worthy of more reflection. Participants stated that for case work to be strategic, it has to be part of a longer term vision with a clear objective for profound social and legal change and the strategy has to be multi-faceted and include different actors such as NGOs. There are numerous possibilities for cooperation between legal practitioners and NGOs in challenging detention. While legal work focuses on questioning the legality of individual decisions, which together will contribute towards the change of course in case law, NGOs should continue challenging the legitimacy of the detention regime in its entirety. We need to do much more work in debunking some of the assumptions that governments present as facts without any objective evidence, such as presenting deportation and detention as having deterrent impact on future migration flows or the necessity and efficiency of detention as a migration management tool. We look forward to deepening the collaboration on more specific issues such as exploring what legal avenues could be used to challenge child detention.